Economic forecaster Lakshman Achuthan is warning investors they could get scorched by one of 2019’s most popular groups. 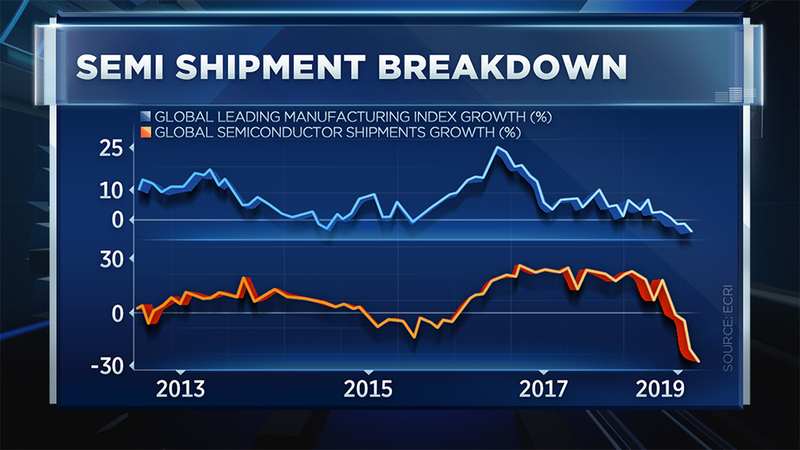 Achuthan believes the semiconductor rally is showing signs of breaking down, and he’s blaming shipment demand. Achuthan, who co-founded the Economic Cycle Research Institute, builds his bearish case with a chart showing semiconductor chip demand. It’s a contrarian call that comes with semiconductors locking in their best day since January 30 on Friday. The VanEck Vectors Semiconductor ETF, which tracks the group, is up almost 22 percent so far this quarter. It’s on pace for its best first quarter since its May 2000 inception date. The bullish sentiment behind the semiconductor rally is centered on forward looking, misguided assumptions about growth, Achuthan said. He ties the continued sluggishness to a slowdown in the overall U.S. economy. “Demand for a product that these companies sell, that’s not going to go up. There’s no rebound in sight,” Achuthan said.